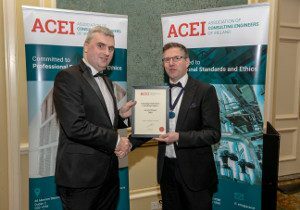 We are very proud to announce the ACEI Emerging Professional Consulting Engineer (EPCE) Award was presented to our Ian Crehan at the recent ACEI Dinner. Ian joined OCSC in 2005 and has worked on many prestigious projects including Dublin Airport, Botanic Gardens, Medieval Mile, Kilkenny and the new Children’s Hospital. He was promoted to Associate in 2016 and has successfully delivered many projects leading the OCSC Structural design team. Ian has also contributed to the growth of OCSC by developing and leading our student mentorship programme, assisting in the development of our graduate programme and participating in volunteering activities. Ian is currently leading the OCSC team on the ESB Head Office Development-Project Fitzwilliam. We look forward to Ian’s continued growth as a professional, innovative engineer.